Collect the computer and system info at a given time in order to track issues or problems. You can share the generated report with your friend or someone of your trust to help you detect your computer problem at a given moment. Run program (.exe) as Administrator. Wait util report gets generated. Open or send the report to someone who can read it and analyse or problem. Note: Program can be executed with '-s', '/s' or '--silent' argument to skip GUI. Report will be generated and the html file will show on explorer after completion. See all the available arguments below. Description: Display a help message with all possible arguments and its usages. Description: Only generate the report without showing or doing anything. Good for scripts or tasks. Description: Run program without showing the GUI. After the report is generated that will be shown on explorer after completion. Description: After the report is generated that will be opened automatically in the default browser. Description: Set the path and/or filename for the generated report file. If the passed path is a directory the default filename will be appended to it. Absolute or relative paths are allowed. "SystemInfoSnapshot.exe -f ." - Use a dot (.) to set the path as same as the executable path or working dir and preserve default filename. If the passed path is not a directory then it will try to save the file in this path. ie: -f "D:\myreport.html"
If you give a existing file path, that file will be overwritten without warning. Description: Sets the maximum number of concurrent tasks enabled to generate the reports. If it is -1, there is no limit on the number of concurrently running operations (Default). If it is 1 it will run in a single thread, best used with single core CPUs or for debuging. "SystemInfoSnapshot.exe -t 1" - Allow only 1 maximum task (single thread). "SystemInfoSnapshot.exe -t 4" - Allow only 4 maximum tasks. Note: See ParallelOptions > MaxDegreeOfParallelism for more information about it. Description: Create a local web server and display live information about this machine on the web. "SystemInfoSnapshot.exe --listen-server *" - Listen the server on any IP in the default port with 10 seconds of update interval. "SystemInfoSnapshot.exe --listen-server localhost:803" - Listen the server on the 127.0.0.1 IP in the 803 port with 10 seconds of update interval. "SystemInfoSnapshot.exe --listen-server * 20" - Listen the server on any IP in the default port with 20 seconds of update interval. "SystemInfoSnapshot.exe --listen-server *:600 30" - Listen the server on any IP in the 600 port with 30 seconds of update interval. "SystemInfoSnapshot.exe --listen-server *:600 30 --max-tasks 1" - Same as above but set the program to work in a single thread to keep low CPU usage. Chosen TPC port must be free, if not server will not start and a error is shown. A report will be generated and kept every "Update interval" in seconds. When using this option the reports will not be saved anymore in files and exists only in memory. To keep the CPU usage to the minimum i recommend using this options with '--max-tasks' option set to 1 and work in Single thread. 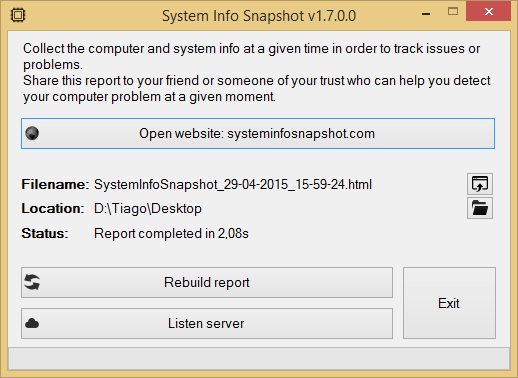 "SystemInfoSnapshot.exe --null -o" - Generate and open the report in the default browser without showing the GUI. "SystemInfoSnapshot.exe -s -o" - Generate, show and open the report in the explorer and the default browser without showing the GUI. "SystemInfoSnapshot.exe --null -o -f D:\snapshots" - Generate and open the report in default browser without showing the GUI. File will be saved on folder D:\snapshots if exists, otherwise a snapshots.html will be created. "SystemInfoSnapshot.exe --null --max-tasks 1 --listen-server *:8080 20" - Listen a server on any IP address on the port 8080 and update the report every 20 seconds. Also set to 1 task in order to save the CPU and keep at minimum usage when generating a new report on background. No GUI. Small and lightweight application with just one executable file. No installation needed, this software is portable and free! A portable free and open source project.